Thank you for this amazing website! I injured my 4th metatarsal on my left foot 7 weeks ago, i have been immobilized since then till my father brought me to a chiropractor thinking it was only a sprain, but it didnt fix it so we went to the doctor and it was diagnosed as a fracture 5 weeks ago and put on a cast(support my feet to be immobilized). I do not experience anymore pain and I would like to remove it so I can resume my activities. I have tried walking and I can do so without experiencing pain. Is it okay to remove it now? Im 20 yrs old male. Thanks! Knowing where the fracture is located is only part of the puzzle, I would also have to know the extent of the fracture. This would include the length of the fracture, is it straight through the bone or only a partial fracture? If it is straight through the bone, what is the distance between the two segments? This and a couple of other issues would be helpful. But since I do not have access to the original x-ray, I will deal with what has been supplied to me. Evidently, you are young, so I will assume you are in overall good health. I will also assume you do not smoke as well. Most simple fractures if properly immobilized will heal uneventfully in six to eight weeks. The only way to know for sure is with a follow up x-ray, which should be compared to the original x-ray. Looking at the newer x-ray we would be looking for what is known as bone callus, which is the build up of new bone around the fracture site. "gap", the space between the two ends of the broken bone has filled in with new bone. If the second x-ray appears as if the bone fracture site has filled in, the fracture may be considered healed from an x-ray standpoint. The next thing we do is actually examine the foot in the affected site. 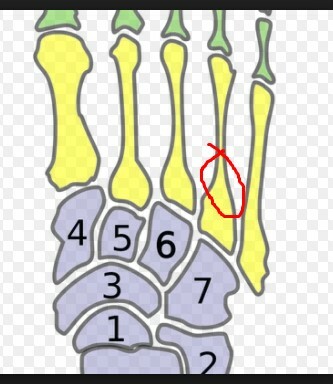 (in this case the base of the fourth metatarsal bone). A doctor will palpate or press in the area to see if there is any pain on direct pressure of the fracture site. He or she will also look for cardinal signs of inflammation, such as swelling or redness. Assuming there is no pain on palpation and assuming there is no sign of inflammation, the next thing the doctor would do is have you walk around a little bit, barefoot, in an effort to see if there is any pain when ambulating. Again, assuming there is none, then you would be considered clinically and radiographically healed. That does not mean you can go out and run a marathon. What is does mean is that for the next week or so, you should be walking around in a stiff soled shoe. If after that period of time, there is still no pain in the affected area, then you could resume all your activities. So, at this point in time, all we know is that doing some walking does not seem to cause you any pain. For me, that is not enough to tell you to resume your life and all your activities. That would not be fair to either one of us. My suggestion to you, if you are eager to get out of the boot, is to go back to one of your doctors, have a second x-ray and be evaluated as I suggest.